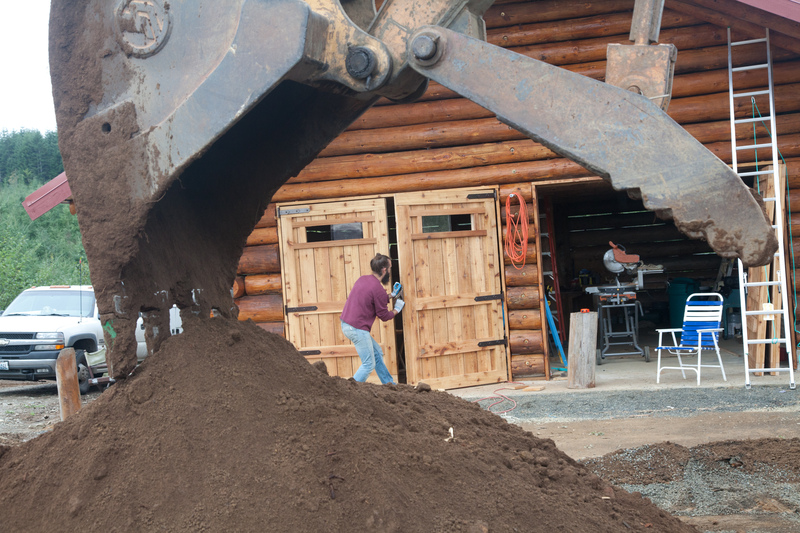 excavation of our property. The before and after photos show the difference. 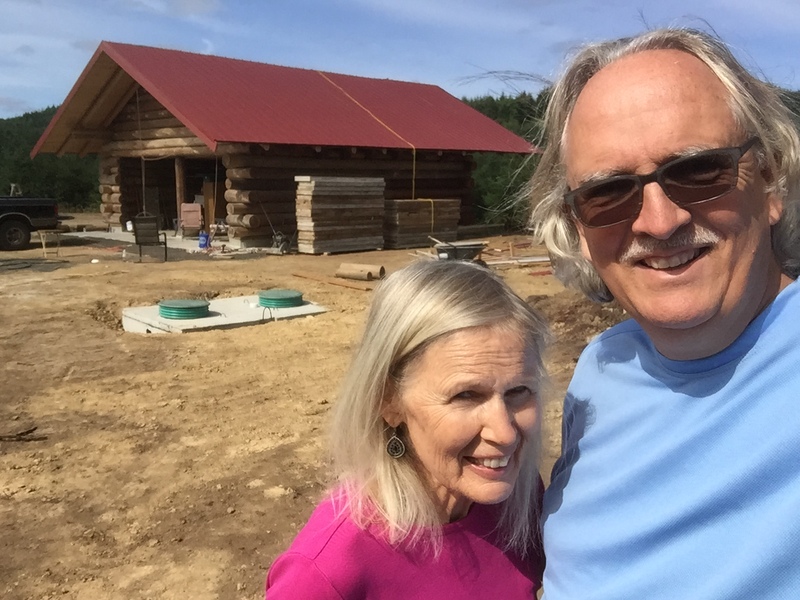 When we bought the property it was covered by 12-15′ Douglas Fir…with stumps and rolling terrain. As we excavated the small trees we developed two huge burn piles. I didn’t realize just how stubborn those piles could be to burn. Bonnie sure had fun spraying diesel on the flames to encourage heat. 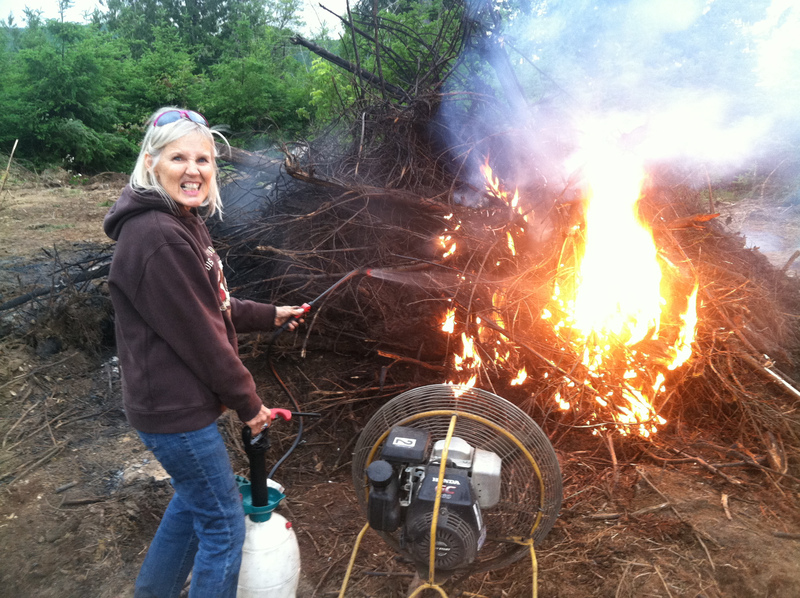 Her favorite pastime became burning the second pile slowly but surely one branch at a time. Jack brought his excavator in to groom our acre. He used a 9′ I-beam with skill. He needed to sloop the ground in the best way to allow the rain to run off and not flood the structures. Now it is nicely groomed and ready for living. 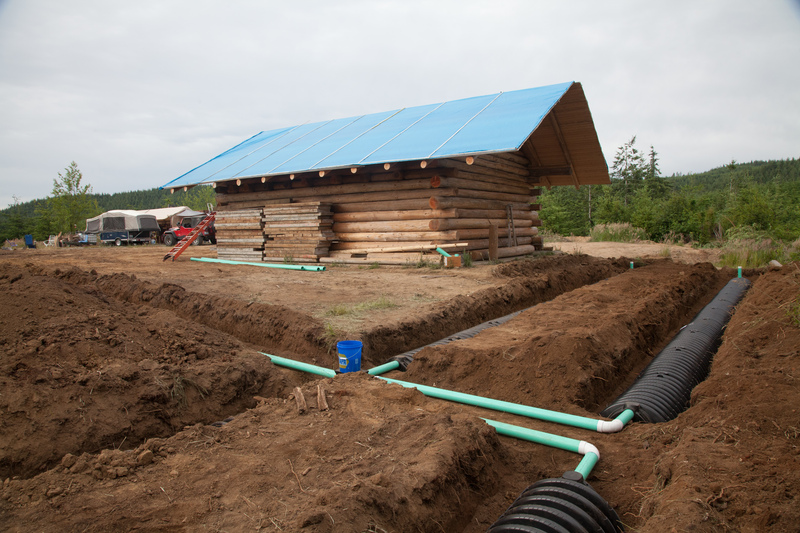 On the same days we were able to dig trenches and add piping for our gravity fed septic system. 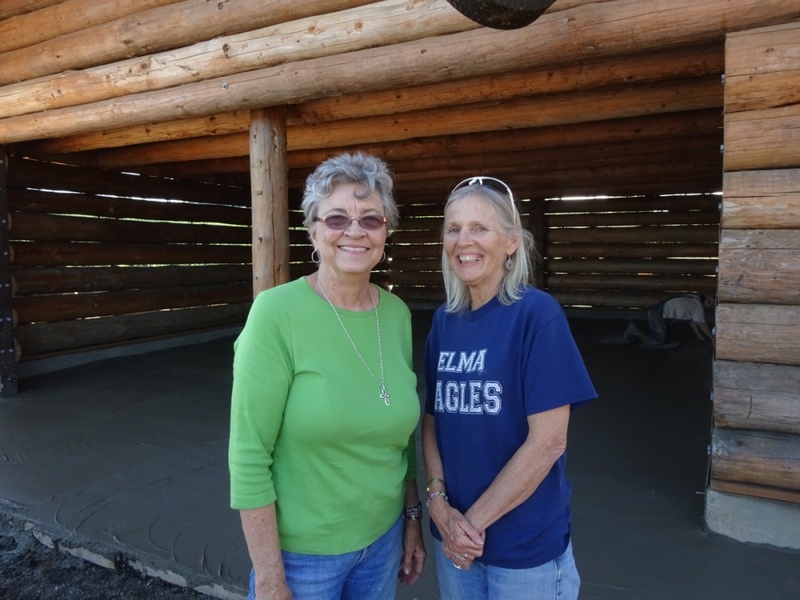 We have 200′ of drain field and a tank large enough for a three bedroom home. This summer I will be setting up our privy next to the tank and piping our toilet directly into it. 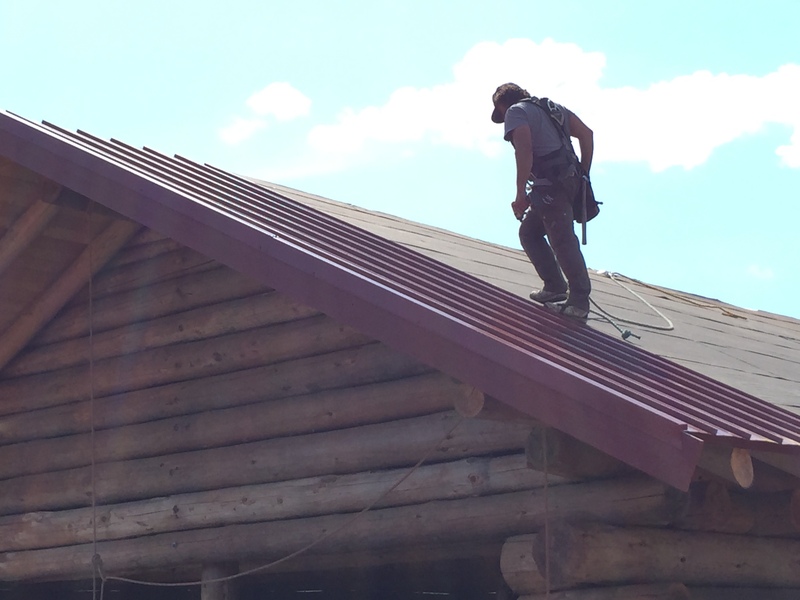 Our next job was to add the metal roof to our 2x6TG and felt. We chose a brick red color and 12″ width metal. Rob and Dwayne had experience so I stood back and played the gofer. A decision we had to make was ‘how much insulation if any’? 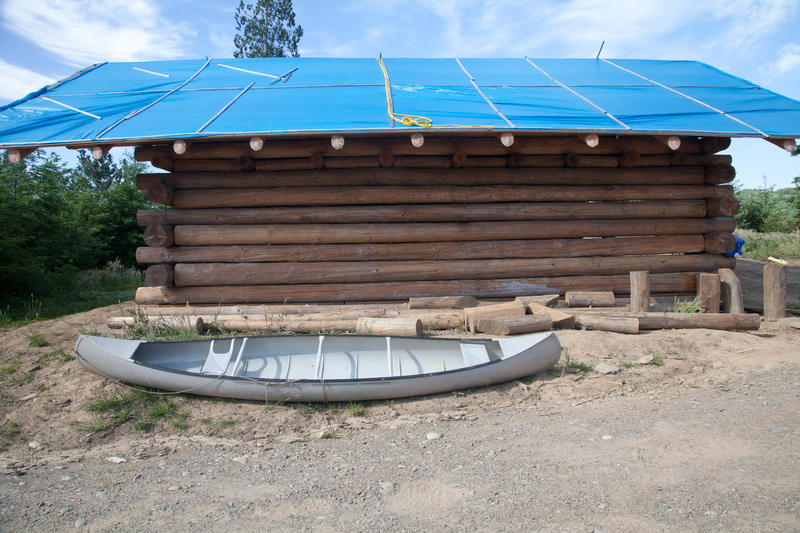 If we went with the same insulation as we will put on our cabin…it would have cost 5k. Of course we could have spent less for less ‘R factor’. We decided to go with no insulation at all. Our thinking was that in the first place it was a garage and will be used sparingly for ‘living quarters’. 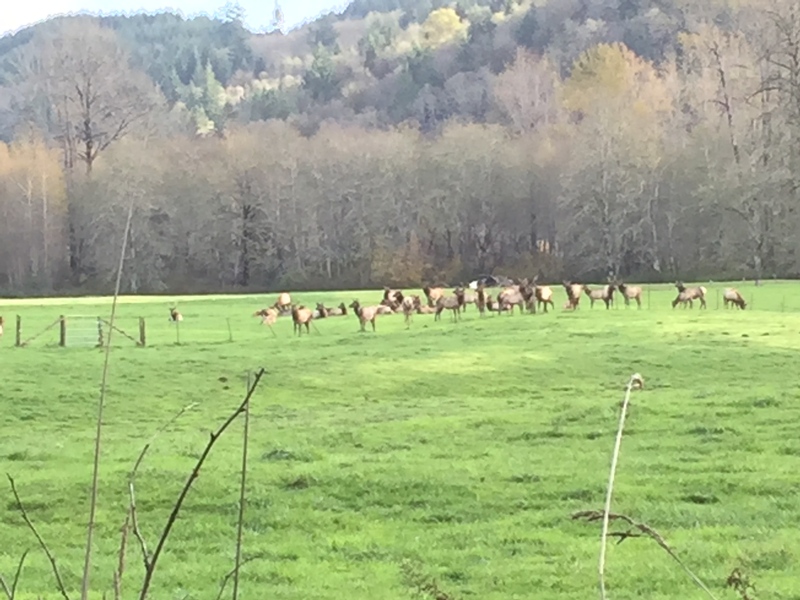 Second, we will primarily be at our property during the summer. Lastly, I will probably have a small wood stove eventually. 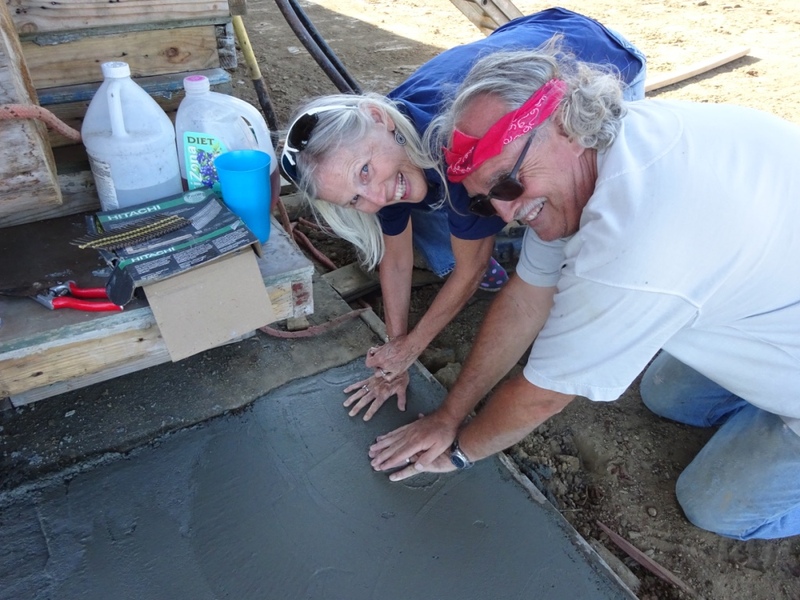 Next was our slab floor in the garage. Again, Rob and his dad(Dwayne) were my ‘go to’ guys. 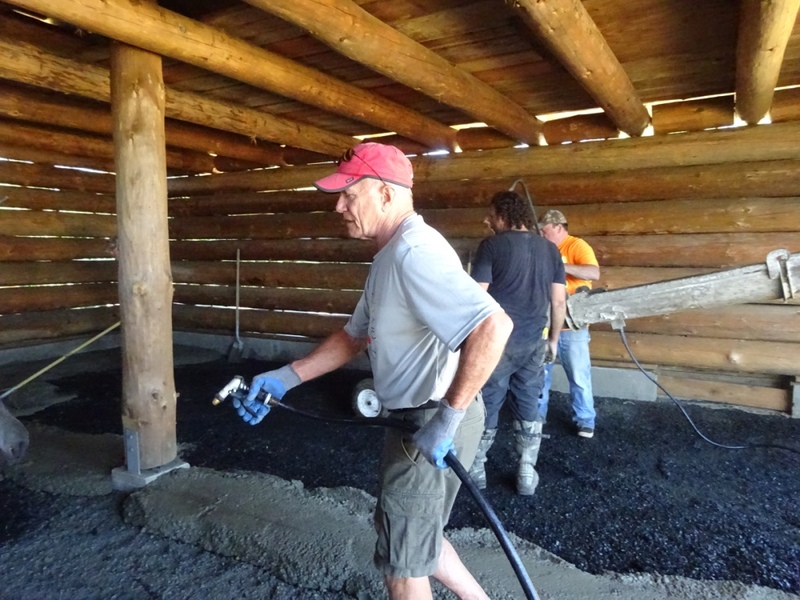 A thick layer of crushed gravel then covering of plastic keeps the moisture off your cement…plus it helps to slow down the setting up of the cement while you are smoothing and finishing. Tom and Yvonne traveled from North Carolina to visit us in Washington. 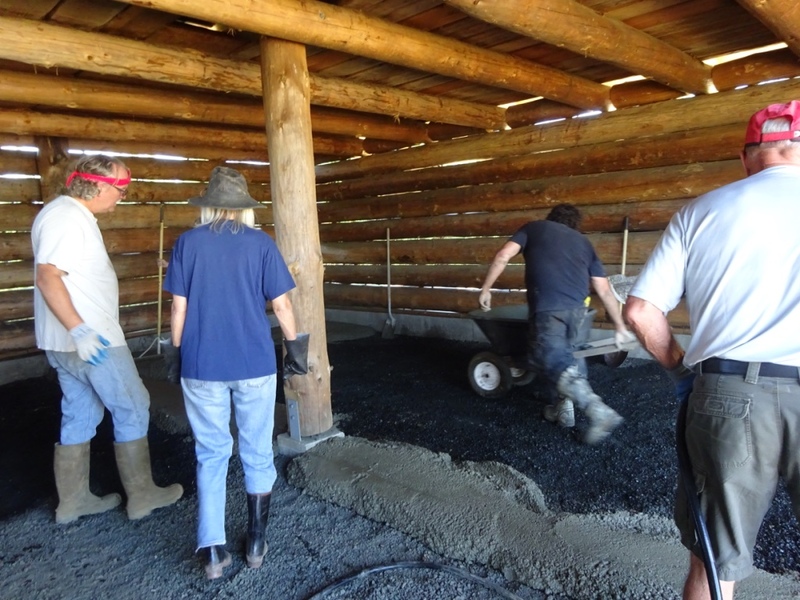 They arrived precisely on the day we poured. Coincidence? Or could I have timed the cement truck perfectly? I’ll never tell. 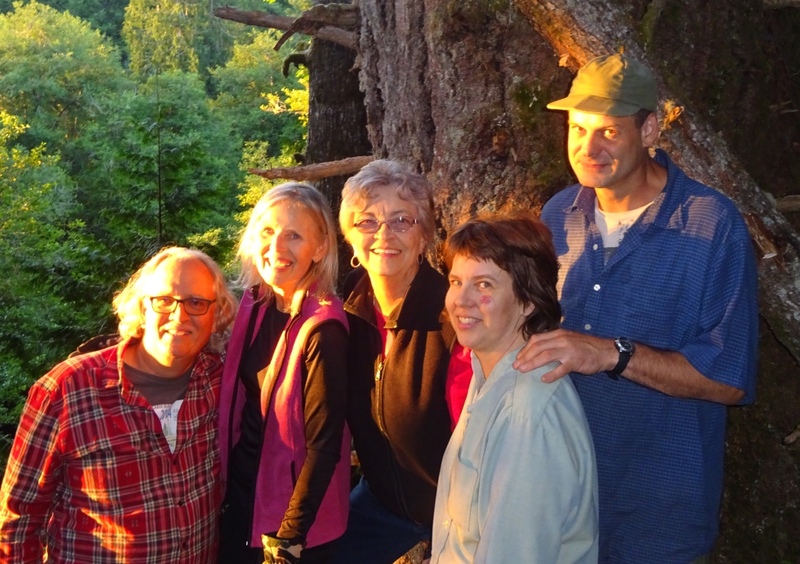 It is always special to have friends visit…wether they are able to help out or just to share a camp fire. 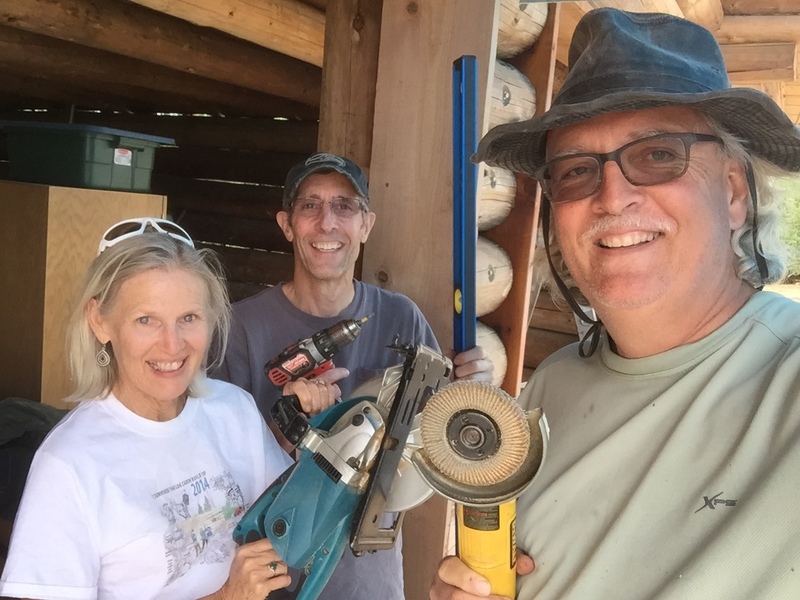 Kim and Chris also helped during the summer…thanks guys! Probably my favorite time of the summer was when Craig my son stopped by for 4-5 days. We hadn’t been able to spend much time together in a while so this time was special. 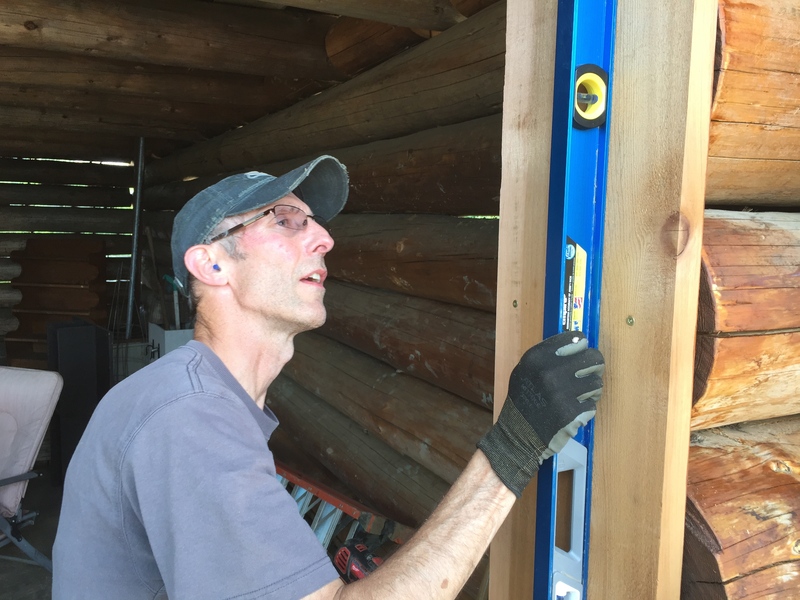 The project of the week was to build the swinging barn doors for the garage. First a good friend of mine Cory, came out for a weekend and installed some fantastic casings for the doors. 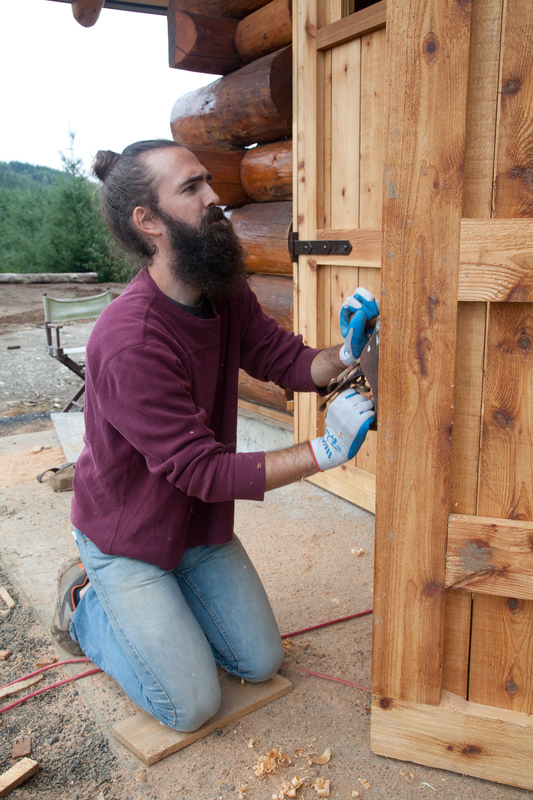 While I added an 18″ wall between the doors, Cory went to work on the casing. 2×12 kiln dried red cedar. Built to absolute perfection. Square…plum…straight…level…and any other way you can say ‘perfection’. If the doors wouldn’t swing it wouldn’t be Cory’s fault. Cory even got the bonus of spotting some elk on the way out. 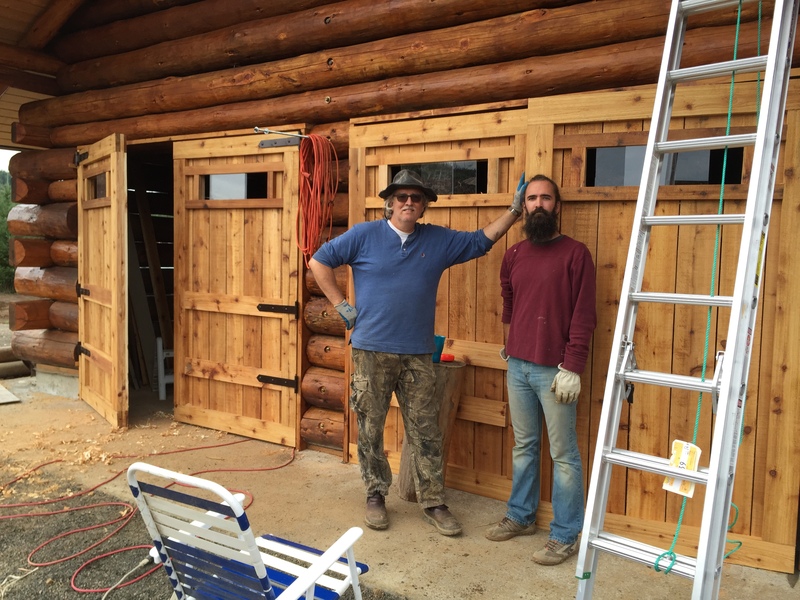 After Cory gave us a great ‘foundation’ of wood…Craig and I set out to build the doors. I could have just hired a garage door builder and had some standard metal doors. But how would that have looked on a log cabin? 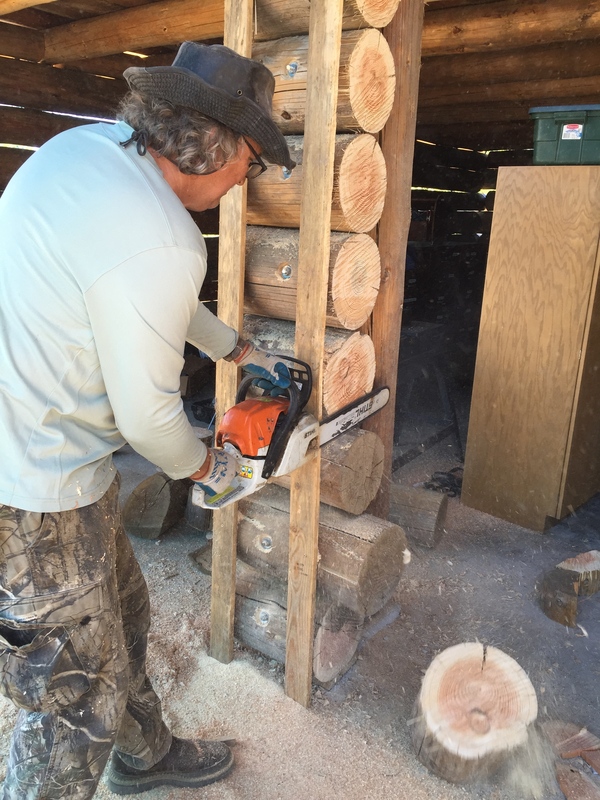 I wanted wood…and I wanted the challenge. 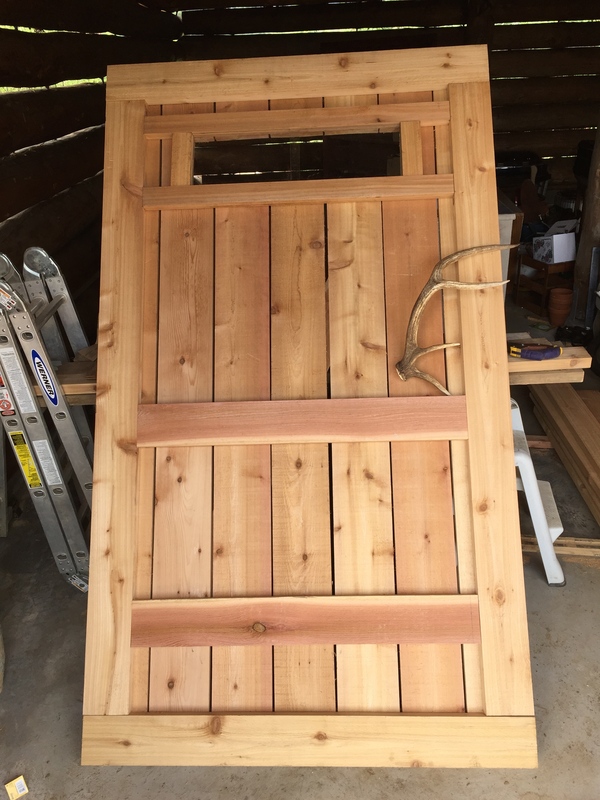 I used a 2×6 cedar frame…on top of 7/8″ verticals…and mirror-framed on the inside by cedar 1×6 with a diagonal piece to boot. I added 8″x30″ windows by making the cutout then framing the cutout with 2x with rabbits made with my table saw for the plastic slider windows. Making the framing and windows myself saved at least $100 per window. This coming summer I will add elk antlers as door knobs. I ordered 18″ strap hinges and had my metal guy Pete weld extra backing plates to accommodate the large ends of the logs. It was tricky getting all the hinges to line up as the logs of course are random. The large custom made back plates helped me to lag the hinges to the log ends correctly. We made sure to seal each piece of wood with Sikkens Cetol ProLux sealer. We thought we’d surprise our grandkids with these bunnies. One of our favorite times…campfire. Posing by one of our big trees. 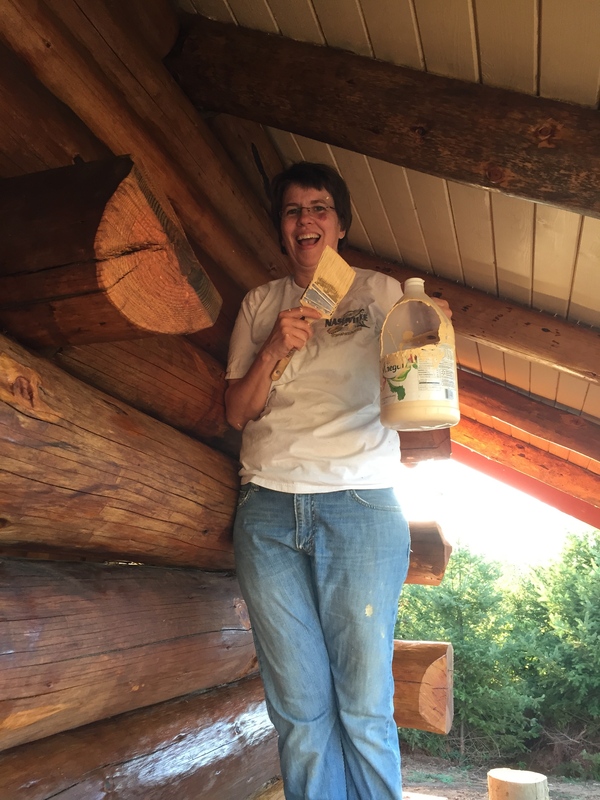 I’m peeling bark off this huge cedar tree we will use as our center post in our cabin. We will add to our solar footprint in 2016. 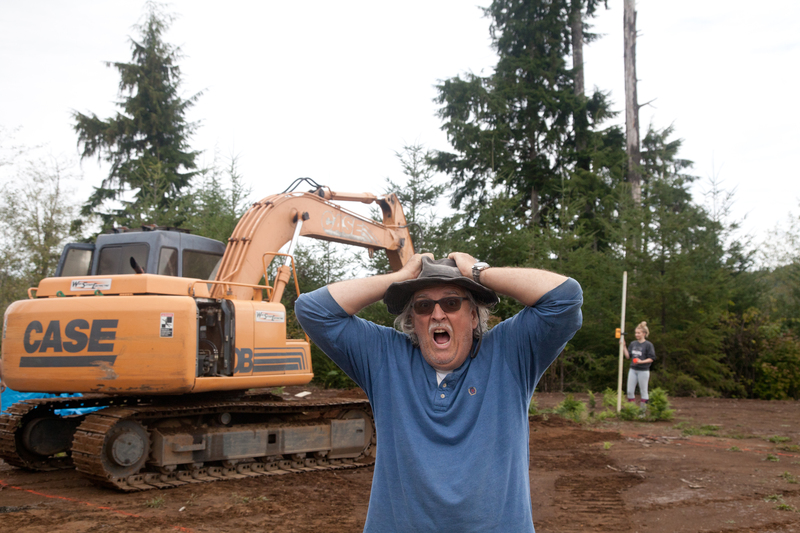 Not sure who is enjoying this more…Eli or grandpa. The hole for our septic tank. 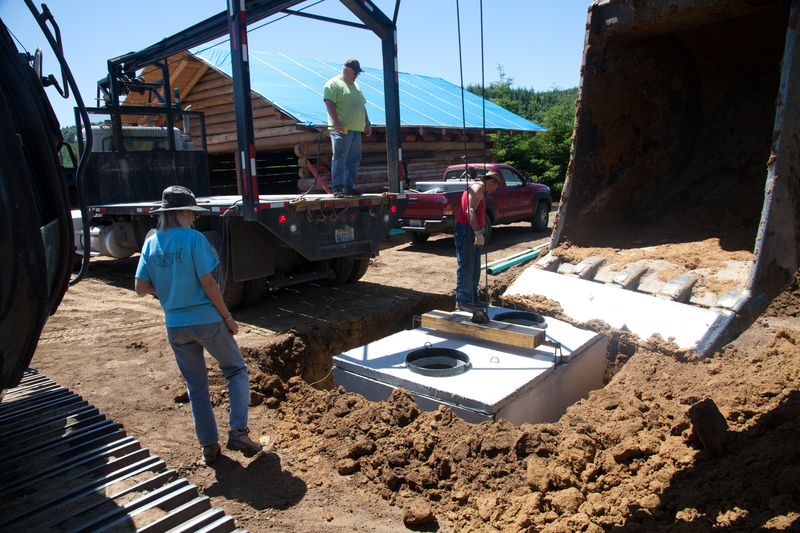 We installed a gravity fed septic system with 200 feet of drain field. Dave and Kevin dropped by on their motorcycles. My Sweetie and I pose by our new garage doors. Craig and I with our nice view. 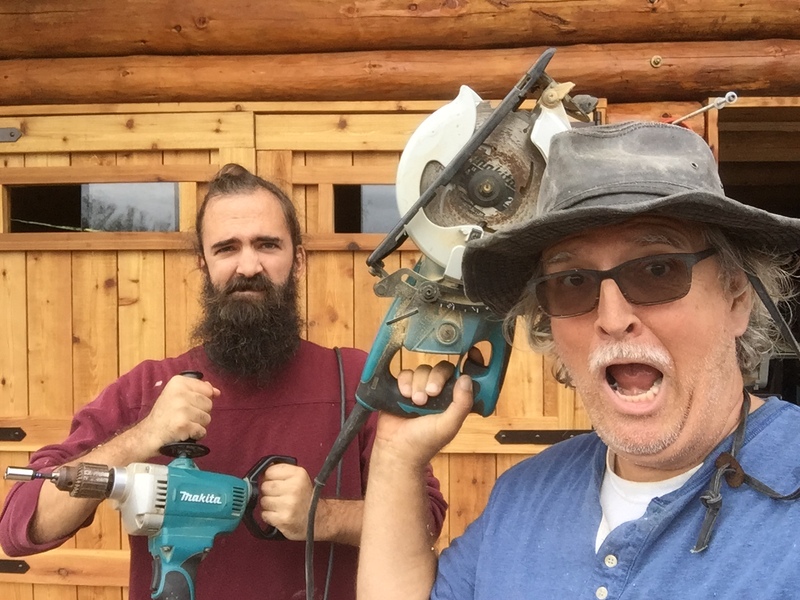 Craig helps me cut our the windows on our doors. I will use elk antlers as door handles. I tried my hand at fly fishing. My friend John and his wife Anne came and spent some time with us. 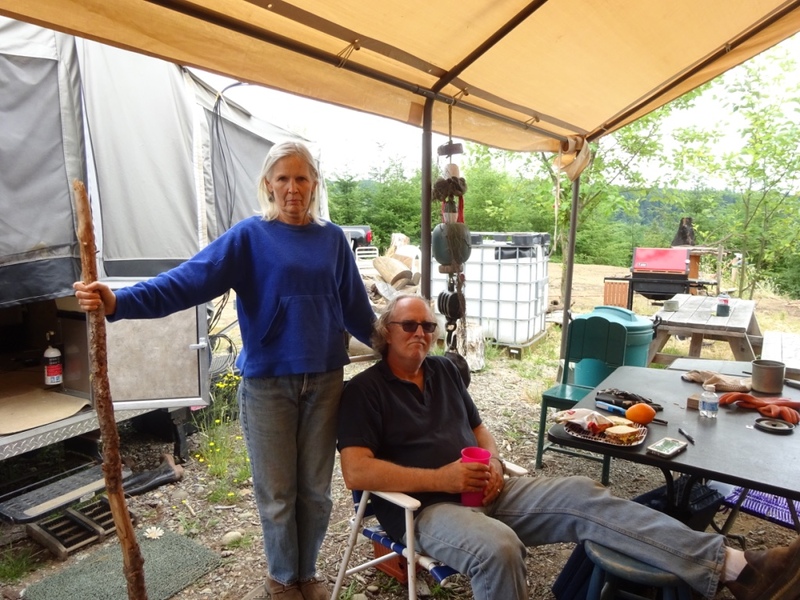 John and Anne join us in the NW. I’m cutting off the excess rod.